Usually appearing when you are between the ages of 17 and 25, your third molars, or wisdom teeth, are the last permanent teeth to erupt in the mouth. While some people never develop wisdom teeth at all, most people have four wisdom teeth, two on top and two on the bottom. When wisdom teeth do not have enough room to erupt normally in the mouth, they are said to be impacted. While some impacted wisdom teeth do not cause obvious problems, they can lead to gum disease or infection, pain, a fluid-filled sac or cyst around the wisdom tooth, and damage to nearby teeth. An impacted wisdom tooth can behave unpredictably. It may grow at an odd angle, perhaps even in a parallel orientation to the jawbone instead of growing perpendicularly up out of it, making it appear on x-ray that the tooth is lying down. An impacted wisdom tooth may erupt only partially or not at all. 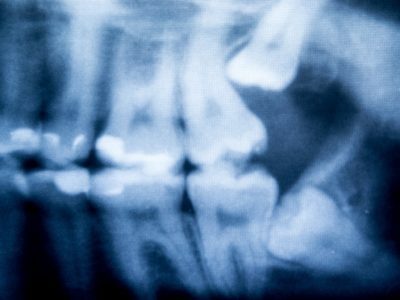 A partially erupted wisdom tooth may develop decay, as food and other debris may get trapped behind an impacted wisdom tooth, contributing to further dental problems. For these reasons, a dentist may recommend the removal of an impacted wisdom tooth even if it is not causing any symptoms yet. Your dentist will provide you with instructions on what you need to do to prepare for the procedure. Be sure to follow these instructions to the letter, and ask questions about anything that you do not understand. In particular, ask about whether you need to abstain from eating, drinking, or taking medication before the procedure, what time you need to arrive to the office, and whether or not you will need to make arrangements beforehand for someone to drive you home afterward. In the past, you often needed to make arrangements to miss work, school, or extra-curricular activities in order to have a wisdom tooth extraction. Modern technology has made wisdom tooth removal much more comfortable. We typically recommend patients have the procedure done on a Friday, which allows their jaw and bone a few weekend days of recovery. Any time you have a dental procedure done, you will receive some sort of anesthesia. When undergoing a wisdom tooth extraction from a sedation dentist, you can expect to receive two forms of anesthesia: a local anesthesia to numb your gums and intravenous sedation given from a line in your arm, which will relax you without causing you to lose consciousness. The sedation anesthesia will not cause you to lose consciousness, so you will be able to respond to questions from the dentist, but you will relax completely and feel no pain during the procedure. It is even possible that you will have limited memory of the procedure after it is completed. Once you are sedated, the procedure will begin. The dentist will expose the tooth and the surrounding bone by making an incision into the gums. In order to access the root of the tooth for complete removal, the dentist will first remove the bone that blocks access to the root of the tooth. The dentist will then remove the tooth, dividing it into separate pieces if this makes it easier to remove. Once the tooth has been removed, any remaining bone or tooth debris will be cleaned away from the site of the surgery, which will then be dressed with gauze and sometimes stitches to control any bleeding and promote healing. If you still have questions about wisdom tooth extraction, contact us today and one of our staff members will get in touch with you.